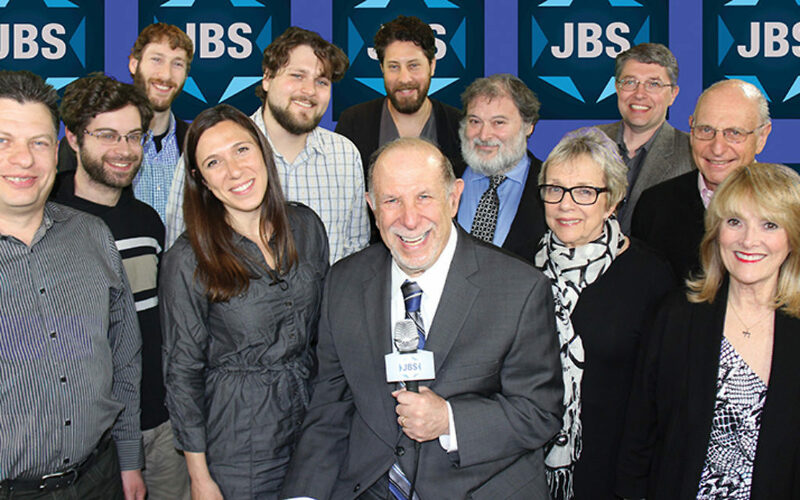 Rabbi Mark Golub, center, is surrounded by Jewish Broadcasting Service staff members. Israelis live in a Jewish culture. Even secular Israelis arrange their year by Jewish holidays, and their weeks by Shabbat. In the United States, we do not live in a Jewish culture, even though if you live in the tristate area you might feel surrounded by Jews. All our mass media assume a sort of bland default Christianity. And the more mass the media, the more true that assumption. You can find Jewish podcasts to download in the exact same place on your phone where you find every other podcast, for example, but if you turn on broadcast television, you’re pretty much back to the Christian default. But there is one station that is all Jewish all the time. 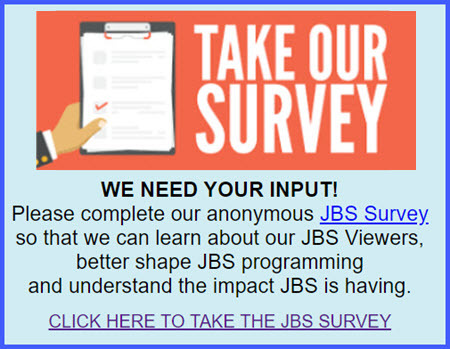 Perhaps unsurprisingly, it is called JBS — the Jewish Broadcasting Service. And its headquarters is in Fort Lee. 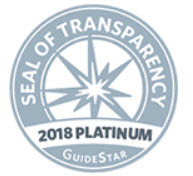 The channel is the brainchild (or perhaps heartchild, given the emotion and passion that is poured into it) of Rabbi Mark Golub. JBS takes a wide-ranging view of Jewish life, and that makes sense, given Rabbi Golub’s background. “I have a unique perspective among American rabbis,” he said. Unique in its range, he meant; it would be fair to say that he had a foot in all the major Jewish religious streams but he is not a quadruped. And perhaps unique in the way that multi-stream, four-footed background has nurtured his dream of making Jewish education available to everyone. But his grandfather, Benjamin Newman, “remained a committed Orthodox Jew,” Rabbi Golub continued. “He became a painter” — of walls, not of fine art — “and then he moved to the Midwest — to Union City, Ohio — and became a peddler. And then one lucky day he found a shiny piece of steel, and it turned out to be valuable. So instead of being a peddler, he went into steel.” He flourished. He brought his wife, Frieda, and their children to America. 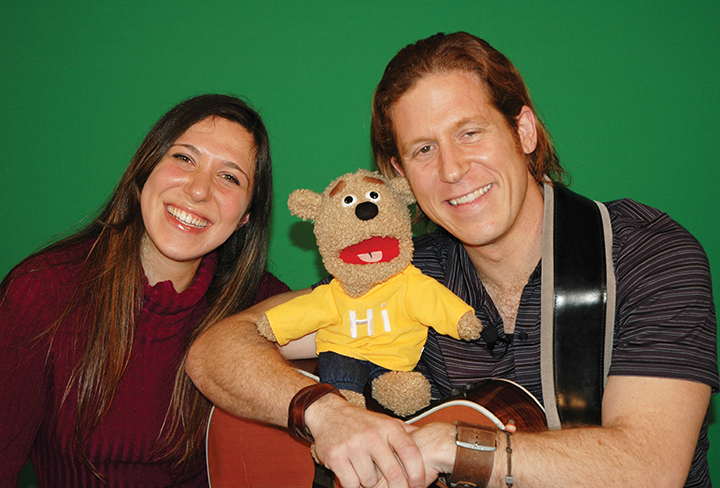 Fella the puppet is with JBS associate producer Darah Golub, and musician Rick Recht. The family — the oldest child, Rebecca, became Rabbi Golub’s mother — moved to the Bronx, and then to Manhattan’s Upper West Side. They belonged to the Carlebach Shul, as it was not yet called. “I was brought up going to shul there, on 79th Street,” he said. “I remember my grandfather sitting on one side of the mechitza, and whenever he wanted to talk to my grandmother, he’d pick up the curtain and talk to Frieda, who was sitting right on the other side. “The way I grew up, it was all about yes, and never about no. Therefore, guided by an internal logic and in search of as much experience as possible, once he graduated from college — Columbia — “and I decided to go to rabbinical school, I chose HUC,” Rabbi Golub said. That’s Hebrew Union College — Jewish Institute of Religion, the Reform movement’s seminary. “That’s because I did not consider myself to be a shomer mitzvot Jew, and JTS required it,” he said. “I wanted to be on the most observant side of the Reform movement. Should he have to label himself, “I call myself ohav Israel,” he said. A lover of Israel. This is an issue that means a great deal to Rabbi Golub. “Rabbis are not holier or better than anyone else,” he said. “Rabbis take themselves too seriously. The point is to take Judaism seriously. To take Torah seriously. But not to take yourself seriously. I doubt, like any other sensitive Jew doubts, and any Jew who says they don’t doubt I don’t take seriously. Jewish tradition is all about searching. “There are moments when I am sure –but only moments. Most of the time there is doubt. “The trick is not whether you believe in God, but whether you act as if you believe in God. Ke’elu — as if. All this is relevant because it is reflected in the JBS’s programming; when he says that he spans the range of Jewish thought, Rabbi Golub knows what he is talking about and means what he says. “And that is every rabbi’s dream. Most synagogues outside the Orthodox movement were established for religious school parents, who are members to get their kids bar mitzvaed — as if bar mitzvah were a transitive verb — and as soon as it is over they are out the door. Instead, Rabbi Golub set up a model where the parents necessarily were as involved as their children; every other Sunday night, he would teach parents of Hebrew school kids. They’d meet in someone’s house and “I would do midrash or Jewish thought with them,” he said. Like many people, Rabbi Golub loved more than one thing. Next to his passion for Jewish life and Jewish education, in a sort of parallel track, ran his love for radio. “And I was just lucky,” he said. It was a no-brainer. Yes, Rabbi Golub said. So he had two strands to his life — “the chavurah in Stamford formally hired me. It’s a unique entity — adults studying every other Sunday night, coming with folding chairs and a chumash.” He also was the assistant editor of the Reform movement’s journal of ideas, Shma. At the same time, “I was WMCA’s editorial director, writing all its editorials. (The station was unusual in that it aired editorials; it was liberal in its orientation.) “And I ended up as a substitute host often, sitting in for Barry Gray and Barry Farber. In 1979, “Peter Straus was tapped by Jimmy Carter to head the Voice of America,” Rabbi Golub said. “Before he left WMCA to do that, I made a deal with him. I would stay for another year, and he would let me stay in my office and let me create a Jewish radio program called ‘L’Chayim.’ It premiered in February 1979, on Sunday, and to this day it has never missed a week. “I still do it now. It airs on JBS now seven days a week.” How does that work? “There are a lot of repeats,” he acknowledged. And now, like all of Rabbi Golub’s work, it’s television rather than radio. Ruth is his wife, Ruth Ellen Gelman Golub; “Everything that is good has happened to me because of my Ruth,” Rabbi Golub said. “I didn’t like Michael at all. I would walk by him and say hi, and he would not say a word. But one day he knocked on my study door and said that he’d like me to help him with an idea. I was his rabbi. It was a cable channel; people had to subscribe to it. Rabbi Golub’s business partner in this venture was his brother, David Golub, who is a “wildly successful attorney in Stanford,” Rabbi Golub said. “We lost money every month at the beginning of the enterprise. Every month David would put in more money. “After about a year, one month he didn’t lose money. We broke even. And from that moment on we never lost money again. We grew and grew and became a force in the Russian American community. All of a sudden my name was known in Russia. And then, once again, everything changed. “The internet caught up with us,” Rabbi Golub said. “It caught up with everyone. All of a sudden, people could go online, or get channels for free, or for much less money. “All I did was answer the phone,” Rabbi Golub said. “The phone rang, and I answered it,” as he had when Peter Straus first offered him a job at WMCA. “A guy named Brad Hammer calls me. There was a door there, and I opened it. “Brad and his partner, David Brugnone, wanted to create a Jewish channel — the first one — but couldn’t do it alone,” Rabbi Golub continued. “They asked me to partner with them. “At the time, all of Jewish television was in one of two forms. You either bought time on a cable system or you got public access time, which was free. In either case, it was of very low quality and only for niche audiences. “But David Brugnone got a cable system to say that it would offer a Jewish channel to its viewers. So we created Shalom TV in 2004, and in 2005 it premiered on Comcast’s video on demand channel. “But video on demand is problematic. You can’t do live programming. You can’t do news. You don’t have a channel number. And a lot of people — the majority of Jews — never knew it existed. So I decided to move from video on demand to live television. The Jewish Broadcast Network began small. “And then we had a big break,” Rabbi Golub said. “Cablevision called me and said they would launch Channel 138.” He changed the name from Shalom TV to JBS, “on the public broadcasting model. He’s hoping to get in more homes, be picked up by more networks, and he thinks that there is a good chance that will happen, although now he waxes mysterious about the whole thing. But “as important as the whole country is, the greater New York area still is the center of American Jewish life,” he said. And the station always is available online, at jbstv.org. The channel’s programming is mainly in English, although it often plays movies, which tend to be in Hebrew, with subtitles; nothing in Hebrew is not subtitled. What’s the channel like? “Imagine PBS if it were Jewish-themed,” Rabbi Golub said. “Then you’d have the idea. Every day, we have English-language news from Israel. It tends to be center-right, because that’s where the Israeli people tend to be. We don’t produce it; we get it from Israel. “Our own programming is very centrist, and very pro-Israel. We celebrated Israel’s 70th birthday with a four-hour live telecast. As an example of our range, on that program we had Rick Jacobs” — the rabbi who heads the Reform movement — “Jeremy Ben-Ami” — the head of the left-wing American organization J Street — “Morton Klein” — the head of the right-wing Organization of America — “Abe Foxman” — the former head of the Anti-Defamation League — “Jerry Silverman” — soon-to-be-former head of the Jewish Federations of North America — “Brooke Goldstein” — the journalist who headlines public radio’s “On the Media” — “Israel consul general Dani Dayan, Ruth Wisse” of Harvard, the writer “Francine Klagsbrun, Alan Solow,” the former president of the Conference of Major American Jewish Organizations. “It’s the entire spectrum of the Jewish community. It’s a huge range — but it’s all pro-Israel. The channel produces five or six hours of new material a day, he said; the rest is reruns or from other places; it includes such shows as broadcasts from lectures at the 92nd Street Y. “We give people front-row seats at some of the most wonderful talks.” Another program, “From the Aleph Bet,” teaches beginning Hebrew, so “people who never were comfortable picking up a siddur now can read the prayer book,” Rabbi Golub said. “It’s the single most successful program we have. “We are the only channel in American television with Jewish studies and Jewish children’s programming,” he continued. “And we are the only channel to show services live. We show services from Central Synagogue in Manhattan. JBS gives elderly homebound Jews a connection back into Jewish life. “We have created a sense of Jewish community for Jews who don’t have access to it in any other way,” he said. “It’s community for Jews who live on the periphery. Who live in Nashville, or in Austin, or in Napa Valley.